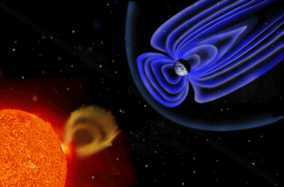 The Exploration of the Earth's Magnetosphere"
. Your comments and suggestions may be sent to Dr. David P. Stern at education("at" symbol)phy6.org. Unless overloaded, I will try to reply. If your question concerns any file here, please name it! Recent addition: Welcome to my World, a diverse collection of writings. "zipped" compressed version of this set (9 Mb) http://www.phy6.org/Education.zip . Open here the home page of a Spanish translation "La Exploración de la Magnetosfera Terrestre", by J. Méndez of Algorta, Spain. Open here the home page of a French translation L'Exploration de la Magnétosphère Terrestre , by Kamil Fadel and Marielle Vergès of Paris, France. Only sections listed there in bold face have been translated. The Spanish version covers most files, but the French one is still underway (3/2003). Both home pages list translated files in bold face. We actively seek volunteer translators to other languages. Please contact the author Dr. David P. Stern at education("at" symbol)phy6.org. For a quick rundown of what these files cover, look up the Overview file. Or else, start wherever your interest lies!